Caption reads: "The Schuylkill Banks Abused. There is no Occupation of any Permanent Importance, Except the Railroads. They Should Run Under Embankments. The Plans for the Schuylkill Embankments Should be Made Now and the Ground Acquired." The basis for this book was a 1924 lecture by its author, local philanthropist John Frederick Lewis, about the deplorable state of the once-beautiful Lower Schuylkill River. 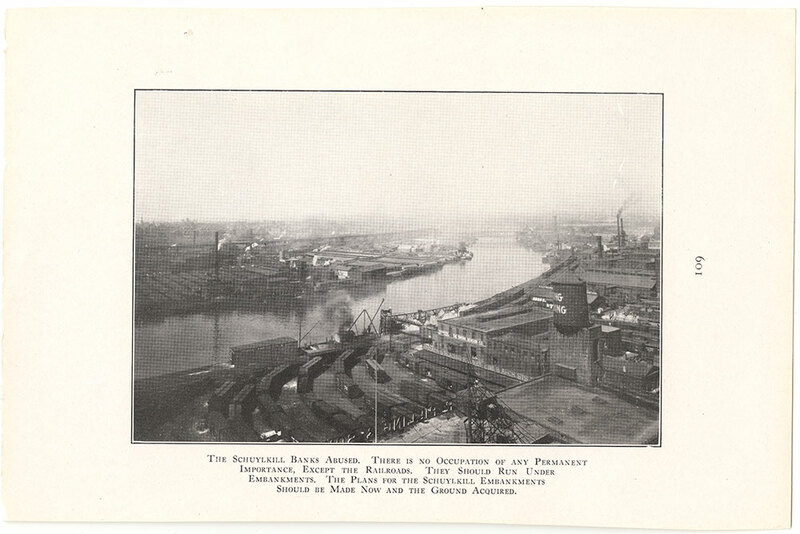 This image shows "the river as it is," with the railroads and heavy industry ruining the quality of the river and living conditions just below the Fairmount Dam.